The Dorset Funeral Plan has scooped a major national award for its high standards of customer care. The plan, which is run by the Douch Family Funeral Directors, scored incredibly highly on a national survey. 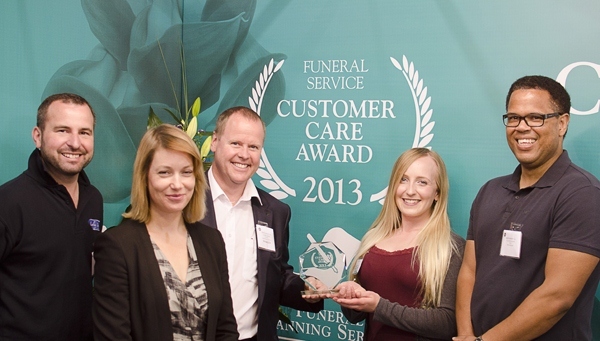 At the annual National Funeral Exhibition 2013 staff were presented with the Customer Care Award at the ceremony in Warwickshire. The survey results showed that over 95 per cent of Dorset Funeral Plan purchasers were “satisfied” or “very satisfied” with the service provided. No-one was dissatisfied and 99 per cent of those who responded said they would recommend the plan to someone else. A comment taken from one of the surveys said: “Very comprehensive, good value and provides peace of mind”. Last year the Dorset Funeral Plan had its most successful year since its introduction in 1999. The plan is one of very few that can include woodland burials, a major area of growth within the industry. It remains highly competitive compared with national plans and has the advantage of being local. The plan was introduced because funeral costs were rising and there was clearly a market for those seeking to organise their affairs. Now it is a hugely popular product and last year’s growth is expected to be replicated this year. While the Dorset Funeral Plan was introduced in 1999, the family funeral firm has been offering similar plans for many decades and was one of the first businesses in the area to do so. Graham Williams of Funeral Planning Services, said: “Funeral directors provide a very personal service to families and some deserve recognition for exceptional customer care. Nick Douch, managing director of the Douch Family Funeral Directors, said: “We are all delighted with the award and it is a reflection on the staff and the care they show all our customers. “The plan has become increasingly popular and last year sales rose by 15 per cent.